Jenna has done everything she can to leave Jennifer, her chubby adolescent self, in the past. She has lost weight, made new friends, finally gotten her first boyfriend, and finally let got of Cameron Quick. Cameron had been her everything when she was little. Soul mates in elementary school. The friends who knew everything about her, but loved her anyway. But Cameron disappeared and to survive his departure Jenna had to shed Jennifer. But then Cameron returns, and with him, he brings memories long suppressed and feelings long buried. Jenna knows she is still Jennifer at her core, but can she be both? We all have childhood friends that stick with us. They are uniquely ingrained in our memories and create the puzzle of our pieced together past. Cameron and Jennifer experienced some pretty horrible things growing up, but it was their friendship that kept them strong, even after Cameron had left and Jenna emerged. Even better, it was a true friendship. No questions asked, no grudges held, just loyalty and love. Surprisingly one of Jenna's new friends steps up in amazing ways. She could be bitter because of secrets, petty the way teen girls can be, but instead, she chooses to just love Jenna, despite everything. So yeah...friendship is pretty awesome. Oh, and the "Best Stepdad Every" award goes to Alan. What an amazing, standup guy! Again with personal preference. Another sad book that is uncomfortably close to my daily life. Unlike Jenna, the teens I know talk. They tell you way more than you're ready to hear, or really want to hear. It's hard for me to get emotionally invested in the lives of characters when my instinct is to build a wall. 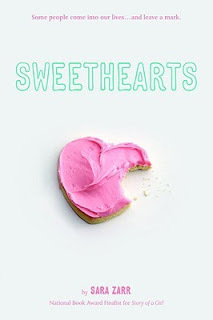 Sweethearts isn't the best realistic fiction book I've ever read. And it's not the best realistic fiction book I've read with similar topics. But it's good, solid, heartfelt, which makes it absolutely worth reading. Zarr does a fantastic job weaving in the past in pieces, showing the re-emergence of Jennifer as Jenna confronts difficult memories, and expressing sympathy and empathy for tough subject matters. Best of all, she shows strong, resilient teenagers who are learning to stand on their own two feet.